A provision in the Obamacare replacement plan by Republicans in Congress sets up a potential clash with New York State over abortion coverage. The plan to repeal and replace the Affordable Care Act by the GOP-led Congress includes tax credits for people to buy insurance policies. The Republican House plan forbids anyone from using the tax credits to buy and insurance plan that covers abortions. Bill Hammond, the health policy analyst for the budget watchdog the Empire Center, says that could lead to a huge political clash with New York State’s laws. “The glitch is that New York State has a rule that says all insurance has to cover abortion,” Hammond said. The law mandates that there be no deductibles or co-pays for the health service. There is a carve out in the abortion coverage requirement for Catholic-run health plans. Fidelis Care, which is the largest health care plan on the New York Health Exchange, set up under Obamacare, does not pay for abortion services, but under a special arrangement the state pays for the coverage. Hammond says if the plan in Congress were to become law, and New York state law stayed the same, something would have to give. If the federal law were to happen, with no changes in New York on abortion coverage requirements, then New Yorkers who need to buy insurance on the health exchange would be limited to just one plan. “I don’t believe that anybody would be happy with that” Hammond said. 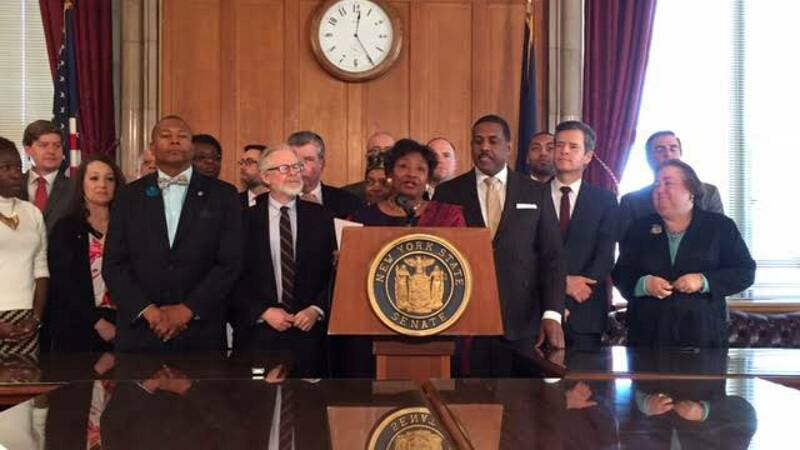 Democrats in the state legislature say that conflict won’t occur, because they say Congress’s current plan is not going to be implemented in New York without major changes. “New York is not about to sit still and have coverage for the full range of reproductive care taken away from New Yorkers,” said Assemblyman Health Committee Chair Richard Gottfried. Senator Liz Krueger says since the state already has in place alternative options for guaranteeing all reproductive health care is covered, it would not be difficult to expand that to cover services that the federal plan wouldn’t pay for. “We in the state of New York would make sure that we created a wrap around form of policy,” Krueger said. “To guarantee women and their families access to all and full reproductive and family planning services”. Senator Krueger and other Democrats say if Congress follows through with plans to cut funding to Planned Parenthood, they want the state to make up the difference. The Democrats held a press conference to react to Congress’s plan, and to propose that the state go it alone and set up a single payer system. Assemblyman Gottfried has long been an advocate. He says it would “undo the enormous damage” that Washington could do, and save money to make up for expected deep funding cuts. Republicans who run the State senate, have so far not been in favor of a single-payer health plan. Governor Cuomo has not offered an opinion.